This is a nutritious hamburger steak wherein tofu and rice are used instead of bread crumbs, and is served with a teriyaki flavor. It is a unique fusion of Japanese and Western cuisines. 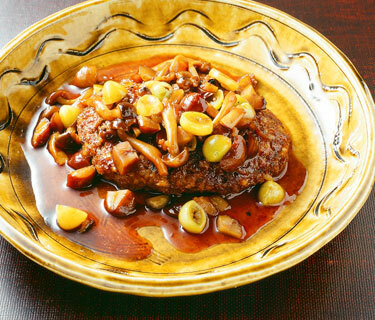 Hamburger steaks with the rich minced meat of Akita Yuri Beef are very tender and juicy. 1) Finely chop onion and sauté thoroughly over low heat. 2) Put roughly minced beef, rice, drained tofu, egg yolk, finely chopped shiitake mushroom and onion prepared in (1). Sprinkle some salt overtop and mix thoroughly with hands until it becomes a sticky paste. 3) Cut off the lower stems of the shimeji mushrooms and divide them into small portions. Roughly chop chestnuts. Cut ginkgo nuts into thick round slices. 4) Grease the frying pan with oil. Roll the mixture prepared in (2) into an oval shape, and place in the frying pan. Flip the steaks when the color changes, and fry with the lid on. 5) Add the sake, soy sauce and mirin mixture as well as the vegetables prepared in (3) before the steaks are fully cooked. Cook for a while. 6) Take out the hamburger steak when fully cooked and boil down the sauce remaining in the frying pan until thickened. 7) Place the hamburger steaks on a dish, pour on the sauce and serve with Japanese mustard. The cattle of Akita Yuri Beef are carefully raised under a health management system, including barns with 50cm thick layers of rice husks at the bottom to protect the body of cattle from the cold, in order to avoid subjecting the cattle to any stress. This is a beef with extensive fine fat marbling and characteristic sweet juices and soft, mellow texture.